Larry's Volvo is an independent auto repair shop specializing in all aspects of Volvo repair and maintenance. We strive to build lasting relationships with all our customers and employees through integrity, honesty, and goodwill. Larry's Volvo is a family run independent car repair shop specializing in Volvos located in the heart of Seattle's Beacon Hill neighborhood. Larry's Volvo was founded in 1980 by Larry Hebert, a dealership technician and then service manager since the early 1960s. Larry's fair pricing and honest service spread through word of mouth by his loyal customers, which allowed him to retire in 1995. 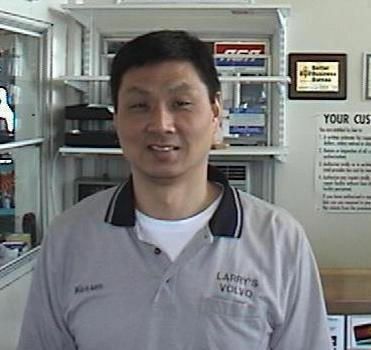 Warren Moy the current owner of Larry's Volvo decided to take over the business after careful consideration by Larry to make sure the quality and integrity of his business was kept. Meet the owner, Warren, and let him introduce you to Larry's Volvo. Ever since Nikolai moved from Boston to Seattle in 1993, he has been getting his two Volvos serviced exclusively by Larry's Volvo. "Larry's Volvo fixed my car when numerous dealerships couldn't figure out the problem in over 10 years! They did it by really listening to what I had to say, and they fixed my car in less than an hour. I have not had the problem since." WE LOVE YOU TOO NIKOLAI! We appreciate being part of the community and we want to let everyone know. We will continue to show our appreciation to our customers by thanking a customer each quarter. As a token of our appreciation, each “customer of the quarter” will be rewarded a small gift.